Winter Moon Farm is located in Hadley, MA. 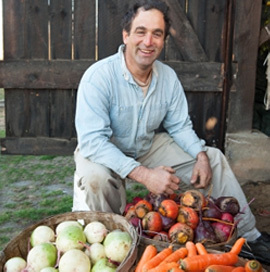 Michael Docter, the owner of Winter Moon, has well north of twenty years of experience farming in New England and you can tell by the quality of the produce he provides us. Winter Moon root vegetables are some of the finest quality roots that you can get in the northeast! Michael's schedule is almost opposite of what you would think of for a farmer in the northeast - he lays low in the summer, the autumn and winter are his busiest times of the year, growing, harvesting and storing everything from watermelon radishes to rainbow beets to purple top turnips to carrots. Michael aspires to make Winter Moon Farm a carbon-neutral operation. He already avoids the use of automobiles, choosing to deliver wholesale and CSA orders local to the farm by cargo bike. Arrays of solar panels provide enough electricity to run the computers and the lights, and also help to keep the coolers operating at the right temperatures. The coolers are unique too; a computer-controlled system of fans and refrigeration units mixes cold winter air from outside with refrigerated air to produce the right temperatures needed for happy root vegetables with low energy cost. See our videos from our visit with Winter Moon Farm in 2010!